Some of us made New Year’s resolutions to eat healthier, stick to our gym membership, to be more generous. Google decided it was time to shut down blog comments. Google’s blog, which brands itself as the “official news on crawling and indexing sites for the Google index,” is a source for internet users everywhere to stay informed on the search engine’s latest news and announcements. In fact, it’s one of the most visited search engine optimization (SEO) blogs out there. Until recently, Google’s blog has been a central spot for community discussion, where curious readers can have their questions answered by one of the webmaster’s behind the change and theorize with other industry professionals. But, just like that, the webmasters are locking the gates. Why? “For every train there's a passenger, but it turns out comments are not our train. Over the years, we read thousands of comments we've received on our blog posts on the Google Webmaster Central blog. Sometimes they were extremely thoughtful, other times they made us laugh out loud, but most of the time they were off-topic or even outright spammy; if you think about it, the latter is rather ironic, considering this is the Google Webmaster Blog. As of January 17th, 2019, only six days after posting, you can see the post has 54 comments. Once you click through on the blue hyperlink, however, no comments appear— as promised. Why Eliminate the Comments Feature? 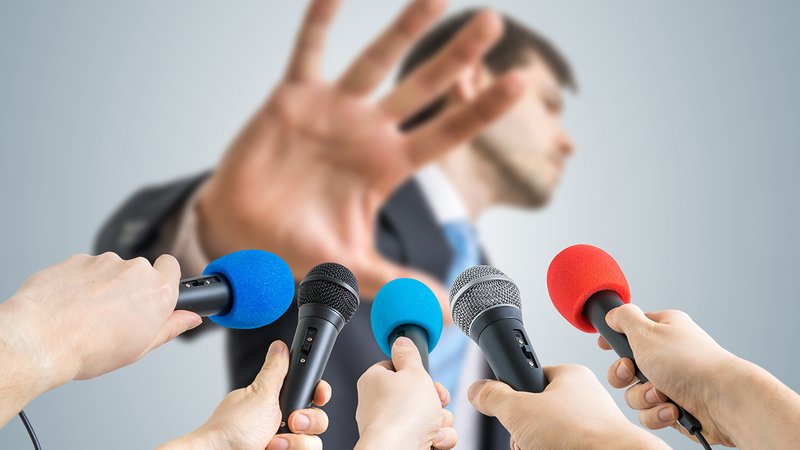 Gary specifically outlined a few reasons why Google made the decision to remove comments from their Webmaster’s blog. Hold up. Do you really think these long threads, sometimes spilling over for dozens of pages, were all read by someone from Google? Doubtful. These comment sections were a place where everyday people could ask their questions and share their opinions, openly. Although Google’s input itself was oftentimes helpful, it wasn’t the driving factor behind all users’ engagement. Many used the Webmaster’s blog comments as a place to exchange knowledge, troubleshoot problems and share online experiences with one another. So why would Google take this important touchpoint away from its audience? It’s no surprise that spammy content is a problem for almost any domain that allows open dialogue. Anyone with a blog is no stranger to sorting through robo replies, inappropriate invitations and down-right unrelated interactions. In 2005, Google tried to give users a way to deter annoying or irrelevant message build-up with its nofollow link attribute meta-tag, but that wasn’t cutting it for many. And it obviously didn’t help the search engine eliminate its own problems. 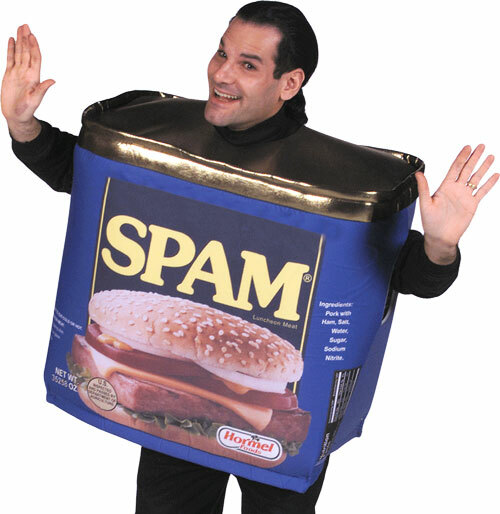 The Webmasters admit that their spam-control issue is “rather ironic,” especially since the search engine created this blog to discuss matters like removing spam and quality control. This touches on a common challenge amongst marketers and blog owners everywhere: if the world’s largest search engine can’t control their spam and threw in the towel, how can us mere mortals expect to combat junky, user-generated content (UGC)? Many popular blogging sites have, in recent years, chosen to eliminate their commenting features long before Google joined the bandwagon. For example, Search Engine Land removed displaying blog comments for a few crucial reasons, one being the sheer amount of time it took to moderate the comments. Now that Google’s nixing blog comments, should we all? Is it Better to Disable or Allow User-Generated Content? Some would argue that comments, like reviews, are a way to actively engage with your audience by developing a rapport, helping them solve their problems and showing others that you’re a solution to similar concerns. If responding to feedback and questions takes priority here, why doesn’t it matter on the Google blog? The search engine even says that “responding to reviews shows that you value your customers and the feedback that they leave about your business” and can improve your local rankings. Even though comments are different from reviews, the basic principle remains: engaging with your audience shows that you value their voice. Comments are also screened by search engines, with the potential to boost your SEO (if they aren’t keyword-stuffed, over-optimized with anchor text or spammy). The SEO argument is a delicate one, as many of Google’s older algorithm updates discredit manipulative optimization plays in comments and don’t help your rankings. While blog commenting isn’t always a viable SEO strategy, it doesn’t mean allowing this feature doesn’t have additional benefits to your business. Establish yourself as a problem-solver. // You are showing the person who engaged on your blog that you have answers, as well as showing other readers that you actively help others. Demonstrate your company’s level of care. // You demonstrate that you care to hear commentators’ opinions, and follow up with a thoughtful reply. Google’s Webmaster update stated that the search engine would now be interacting with their community on our other channels. 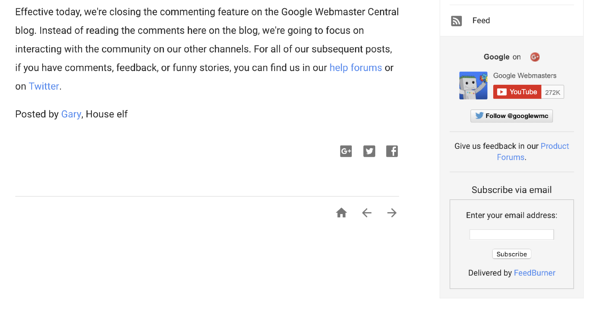 The Webmaster Central Help Forum allows you to search for threads related to your queries and to engage in a similar way to a blog post comments section. Just like the blog, Google employees may answer questions here, but for the most part, Top Contributors— or active members of the community— will respond. Questions can also be Tweeted to Google’s Webmaster’s Twitter, although obviously this would only be ideal for smaller concerns (because of the social network’s Tweet character limit). Google’s decision to move communication to channels other than blog comments begs the question: should your business do the same? Are there other networks that your customers prefer over blog post comments? How are you welcoming dialogue with prospects? What about with your long-standing supporters? If you are still on the fence about whether you should allow comments or not on your blog, it may be time to reassess your goals. If developing strong customer relationships is one of your company’s core values, you might want to consider taking the time to respond to all user-generated content or clearly outlining the best platforms or methods for receiving feedback. 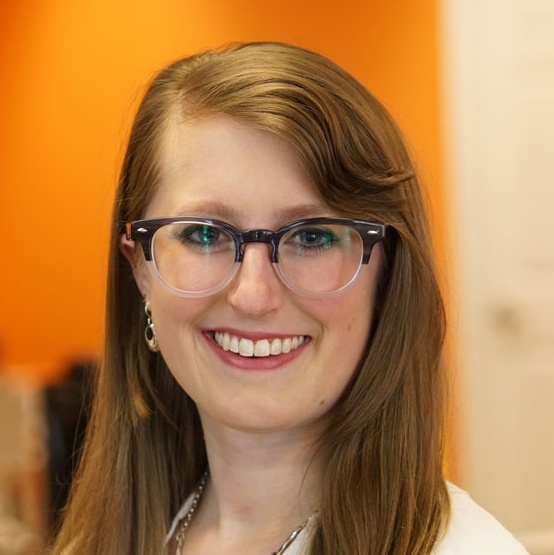 Need help with your blogging strategy? Download our Beginner’s Guide to Blogging, today.